Fitness fanatics, gym junkies and clean eaters of Melbourne, you'd better prepare your protein powder because the Australian Health & Fitness Expo is finally coming to Melbourne! 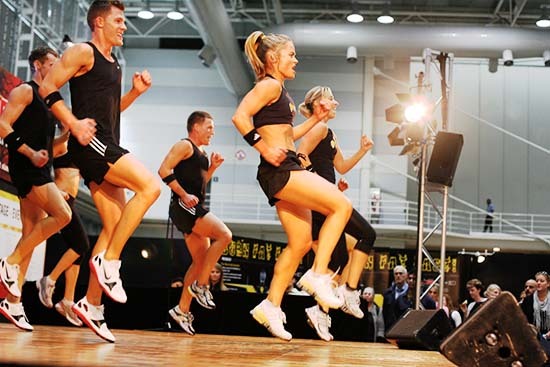 Taking over the Melbourne Convention & Exhibition Centre from 4th – 6th April, the Australian Health & Fitness Expo features world-class events and fitness demos, as well as over 250 exhibitors selling the latest fitness equipment, apparel, sports nutrition and supplements. Co-locating with FILEX, a fitness industry convention, the Australian Health & Fitness Expo is designed for professionals and gym junkies alike; Friday is an industry-only affair, while the Saturday and Sunday areopen to all health and fitness enthusiasts. So, my fit friends, what's there to see? You can watch Australia's top 60 CrossFit athletes battle it out in the purpose-built Reebok Arena, plus the Men's Fitness Fit Bloke and Shape Fit Chick Challenges running for three gruelling days during the expo. Other competitions include the Australian Powerlifting Championships, Jiu Jitsu State Championships and the Asia Australia Amateur Boxing Championships. You can also check out the spray-tanned, muscly talent at the INBA Natural Body Building competitions flexing throughout the expo. If the sumo squatting, power lifting, kick-boxing action is all a bit too much for you, head right on over to the Les Mills stage. Showcasing the latest group fitness routines, you can test out a new express class, register for one of the challenges and have a good old chin wag with the Les Mills program directors. As if it doesn't get any better, Les Mills and Reebok are bringing Timomatic to Dance-a-Palooza, in what may just prove to be the ultimate dance-off between the smooth mover and Les Mills instructors. A boogie not to be missed! Are you a die-hard The Biggest Loser fan? The fabulous Michelle Bridges will be running a special group VIP personal training sessions (unfortunately already sold out! ), while Commando Steve will also be dishing out his signature 'treat 'em mean, keep 'em lean' military-style training (again, all sessions have been snapped up!). Not to fret, the two trainers will be taking part in a meet and greet, so grab your camera and get flexing! Experiencing a bit of muscle fatigue? Head to the Team Up Healthy Living & Endurance Stage, where you can catch a healthy cooking demonstration by 'The Healthy Chef' Teresa Cutter, presentations by our mate Michelle and Q&A sessions with Commando Steve, and so much more!